Without careful attention, faith-based organizations drift from their founding mission. It's that simple. It will happen. Slowly, silently, and with little fanfare, organizations routinely drift from their purpose, and many never return to their original intent. Harvard and the YMCA are among those that no longer embrace the Christian principles on which they were founded. But they didn't drift off course overnight. Drift often happens in small and subtle ways. Left unchecked, it eventually becomes significant. Yet Mission Drift is not inevitable. Organizations such as Compassion International and InterVarsity have exhibited intentional, long-term commitment to Christ.Why do so many organizations--including churches--wander from their mission, while others remain Mission True? Can drift be prevented? 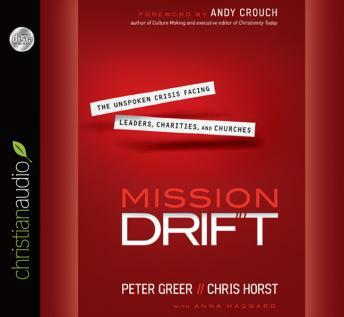 In Mission Drift, HOPE International executives Peter Greer and Chris Horst tackle these questions. They show how to determine whether your organization is in danger of drift, and they share the results of their research into Mission True and Mission Untrue organizations. Even if your organization is Mission True now, it's wise to look for ways to inoculate yourself against drift. You'll discover what you can do to prevent drift or get back on track and how to protect what matters most.